Those poor palms! Let’s face it Ya’ll, we’re in North Texas, and it got really cold this winter! By Nature, Palms are tropical plants and even the hardy hybridized ones that you can buy at many nurseries can be affected by this cold weather we’ve had! Apply these 3 simple care techniques to your palm trees, and you’re sure to have amazing looking palms highlighting your landscape! - Prune it properly – as palm trees don’t need the leaves at the top, they get rid of them. You’ve probably seen pictures of palm trees with those giant, “fluffy” trunks, right? The “fluff” are actually the dead palm fronds. These giant nests can be great homes for things you probably don’t like, like rats and cockroaches and stuff, so go ahead and get rid of it to clean things up! How – you want to prune off the dead and dying “fronds” (remember, those are the giant leaves!). palm fronds can get thick, so your better off with a saw vs. a pruner, but remove each frond near the trunk of the palm. Prune the fronds, living, and dead to about a 45-degree angle, and your palm will have a nice, healthy, tropical look to it! Feed them – Fertilization is one of the most overlooked, yet important tree care need that most trees need. See trees are taken from the natural environment, which has soil loaded with nutrients, to the dry, barren wasteland” of a soil that most of us have in our front yards! 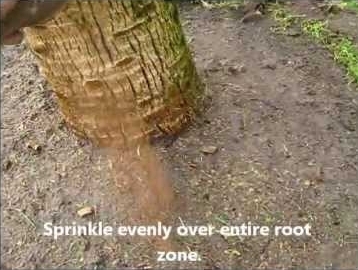 Your Trees are STARVING for the right nutrients to be healthy if you’re not fertilization. You wouldn’t starve your pets, right? how about your green pets? Well that’s it, palms are relatively easy to maintain, but it’s SUPER important that they get consistent feeding and a little protection during the winter to really be a fantastic addition to your landscape!